We sweat the details, so you won’t worry again. A Certified Public Accountant helps you understand and improve your business and personal finances. A Watkins and Company CPA does more. It’s the goal of Watkins and Company to be a partner in your business success. Watkins and Company can work with you each month and provide tax and business advice that you can use to guide your own decisions. 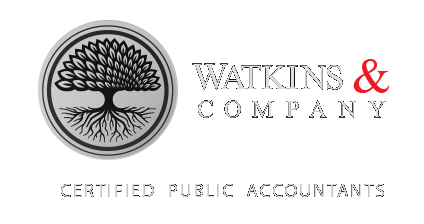 Watkins and Company CPAs can help you with business accounting services, payroll services, Quickbooks, business and personal tax planning and preparation as well as business consulting and business start-up planning. With experienced and highly-skilled CPAs, Watkins and Company brings you expertise in personal and business finance and the technology skills to keep you up to date with the latest in accounting and financial assistance. Its dedicated staff takes hundreds of hours of continuing education each year to stay out in front of your needs and to maintain state and federal certifications and licenses. Watkins and Company stays in touch with the business and economic climate in this time of constant change in the market and ever-changing laws, so you have someone at your side and on your side. Our CPAs with a personal approach are dedicated to your success. By keeping up with your monthly business activity, Watkins and Company can help guide you throughout the year to a profitable future. A mid-size firm in Flowood, Mississippi, you can call us or contact us through this website and we can discuss your personal and business accounting needs and how we can help. The sooner we hear from you, the more we can help.